Welcome to Palace of Peace. This amazing ocean view home is an artistic and luxurious architectural masterpiece ready to welcome you to paradise. You will love the creative details and intricacies incorporated into the home while being completely enchanted by all the natural beauty that surrounds it. A postcard like view from every room, and the soothing sounds of the ocean will truly bestow a sense of peace as you escape from it all. The main house is offers 7 spacious ocean view bedrooms, each with en suite baths, and private balconies with panoramic views of Flamingo bay and the Catalina Islands. There's a smaller 8th bedroom, also with ocean views and a shared bath. As well, there is a separate guest house with 2 bedrooms, 1 bath, and a fully equipped and private kitchen. Completely relax in the infinity edge swimming pool overlooking the gorgeous views. You'll be in complete privacy surrounded by nature, all you can hear are the sounds of the tropical birds and the crashing waves. There is an expansive ocean view deck adorned with sun loungers with lots of room for everyone to spread out and enjoy nature's beauty. There's an expansive dining area adjacent to a rustic and inviting bar, where you can lounge with your friends and family. In the center of it all is a charming living area with plenty of space to relax and read or watch TV from the 42 ' plasma flat screen. With Ocean views from every room in the house you will be raptured by the amazing sunsets over the pacific every day during your stay. The kitchen is well equipped and is perfect for large groups, with two double wide refrigerators, ice maker, coffee maker, toaster, microwave, blender large platter serving trays and more. A daily breakfast chef is included in your stay, as well as daily housekeeping, so you can completely relax without a worry or a care. 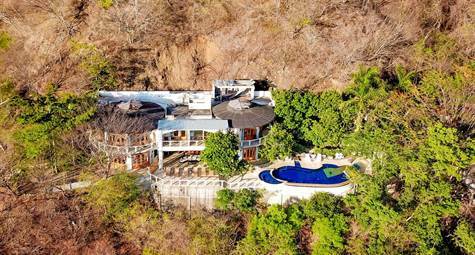 The house is located within minutes of several fantastic and secluded beaches, such as Playa Penca, Sugar Beach, Playa Prieta, and more. Just a 3 km drive north takes you to Playa Danta where you can enjoy a variety of adventurous activities such as snorkeling, kayak, paddle board yoga, horseback riding or mountain bike on the manicured trails through the rolling hills in the middle of the jungle and up to ocean view ridges. Here you can also enjoy the famous Season's gourmet cuisine beachfront restaurant. an enchanted kids park and tree top swings for the kids to play. At the house everything is provided for you, fresh towels, linens, daily maid service and a cook to help you with the breakfasts. Extra help can be hired for cooking more meals throughout your stay. Our property managers are very helpful and can arrange your airport transportation and other activities for you, full concierge service available just a phone call or email away! Enjoy the luxury of living in serenity and seclusion, in this amazing compound boasting multiple living areas for multiple activities. Love Nature, Live Nature, Enjoy the Costa Rican Experience !